Earlier in the year, like nearly every Southern Californian is wont to do, I went to the beach on a bright and hot summer day with my friends. But even a week after returning home, grains of sand were scattered everywhere and stuck to everything I owned: my car, bags, swimsuit, and every crevice of my clothing. While some may find doing the laundry particular inconvenient after a beach day, I found myself relishing the sensations that reminded me of that wonderful day by the seaside. For many, sand is a symbol: of oceans, the passing of time, our origins, our earthiness, and our resting places. That is why sand often used for various relgious ceremonies and rituals. The Unity Sand Ceremony is one such ritual that metaphorically demonstrates the joining of different lives to make something that, once blended, can never be separated again. Today, we'll be talking about the functions of glass sand, and its role in an increasingly popular ritual known as the Unity Sand Ceremony. Vase Market offers a diversity of vase fillers, from glass marbles to acrylic gems. However, our new line of glass sand occupies an interesting space in the art world of decoration. Unlike other types of vase filler, sand can easily fill all kinds of containers, no matter how uniquely shaped. They not only allow for colorful and creative blends to clear glass vases, but also provide weight and controllable stability for holding candles and stemmed plants in place. Even with these practical applications, glass sand might still seem like an unusual choice. But what makes our sand fillers so special is that they work for many kinds of crafts and projects like sand painting or dioramas. Through art, sand can become something deeply meaningful for the people who use it. The Tibetan mandalas are a perfect example. After long meticulous hours of dedication, these beautiful mandalas symbolizing the intricacies of the cosmos are swept clean to show the temporary nature of life and beauty. 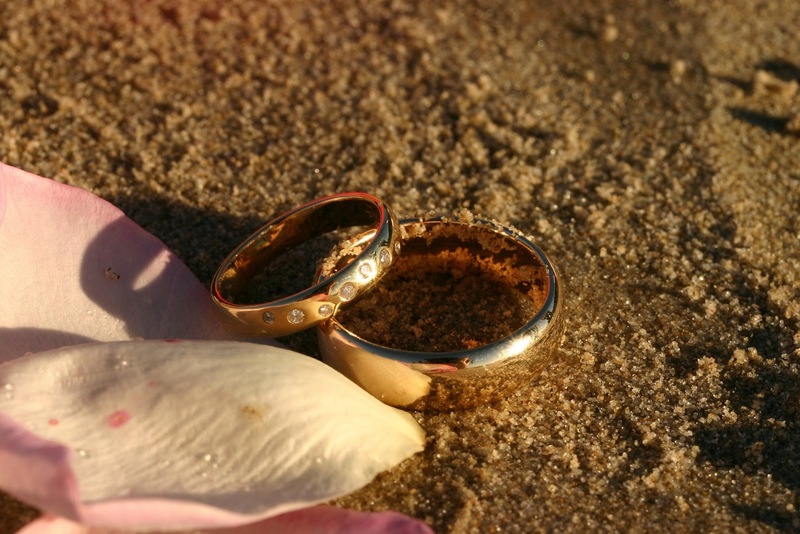 For outdoor and beach themed weddings, many couples opt for the unity sand ceremony as a way of symbolizing their union. For newly weds, sand presents an opportunity to create something completely unique, blended by the hands of individuals joined in marriage, to be stored in a glass vessel and placed on the bedside or mantle of the couples home. 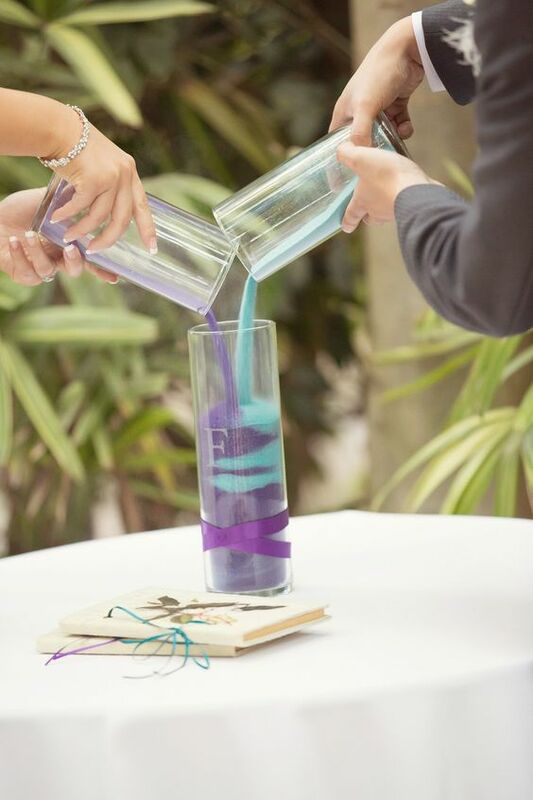 While we can contemplate the many ways to carry out this ritual of the unity sand ceremony, one must also consider the right colors and the right vessels for your special day. Colors can be just as meaningful to the individuals participlating in the ceremony, and its important to choose colors that are felt to best represent the individuals, their personalities, and their traits. At Vase Market, we keeps a rainbow of colors to choose from: cobalt purple, cinderella blue, metallic gold, black, grey, slate blue, beach sand beige, seafoam turquoise green, yellow orange, desert orange, light pink, moss green, salmon pink, dark plum, metallic silver, violet, red plum, and white. 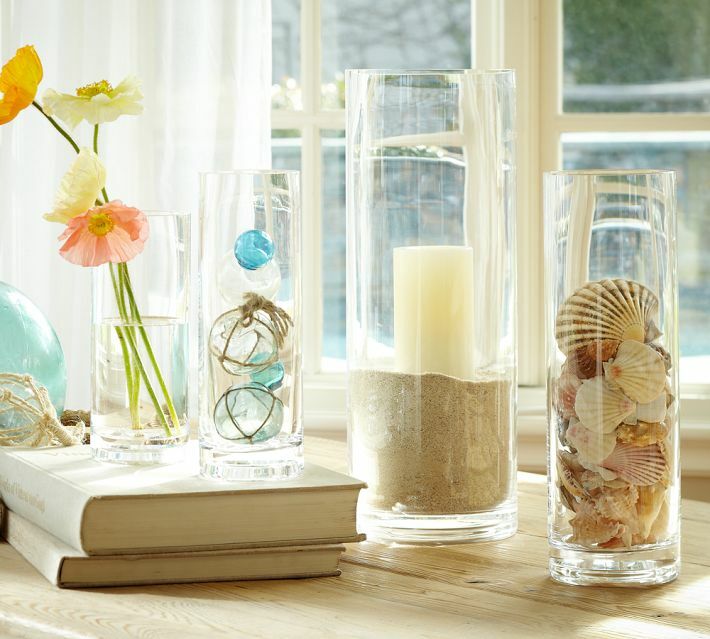 Among vessels, glass vases and jars seem like obvious choices. Glass block vases are simple and easy to customize. Tall and slender square block vases such as these, make excellent vessels for the act of pouring. Many of our rectangular vases have a flat, slimmer look that works perfectly as the main vessel for displaying blended sand after its poured. Our Cylinder vases are equally functional. As we've said time and time again, nothing beats a classic cylinder vase. A straight-sided silhouette presented by both cylinders and block vases is simple enough to visually prioritize the colors of the sand. They're also easy to decorate with ribbons and personalized embossments or engravings. The same could be said for apothecary jars. The included lids make the storage and portability of this memorable moment convenient. Their very shape is suggestive of sacred chalices, which is fitting for a day as meaningful as a wedding. Among our most popular jars for sand ceremonies include GAJ113, GAJ123, GAJ115, and GAJ118S to name a few. 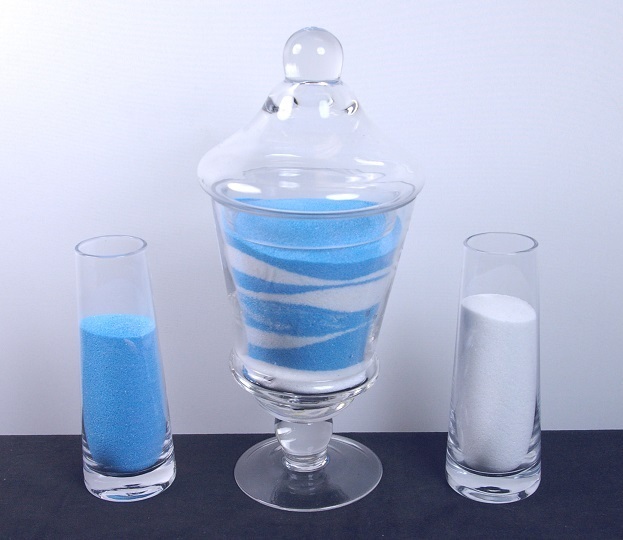 In the example above, we can see how beautifully the cinderella blue and white sand compliment each other in the jar. Rituals like sand ceremonies are a way of bringing, not just pairs of loving indivuals, but their friends and families together in celebration. While the ceremony is a historical tradition, there are no concrete rules for how it should be done. Just do what feels right for you and your partner, and I guarantee it'll be a happy event. We hope you enjoyed our newest post! If you like what you see, and you wanna see more, be sure to check us out on Yelp, Facebook, Wedding Wire, Pinterest, and Instagram for more info! You might even stumble upon special offers and coupon codes! Be sure to check out some of our most popular vases and accessories! 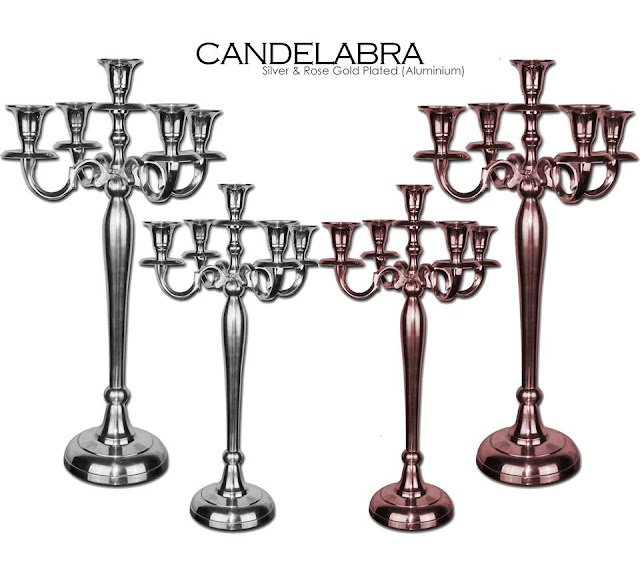 This week's highlight: Silver and Rose Gold Candelabras. 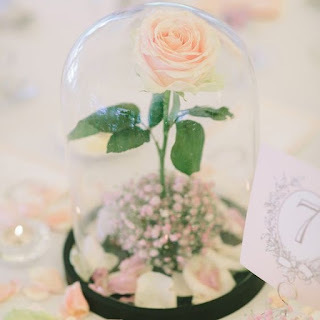 Vase Market is a wedding vase and home decor wholesaler from City of Industry, California servicing weddings and events throughout the local area, including Los Angeles, Orange County, and San Diego, as well as throughout the United States. Vase Market is a professional direct importer that has been part of the Southern California glassware industry since 1998 specializing in high-end glassware.